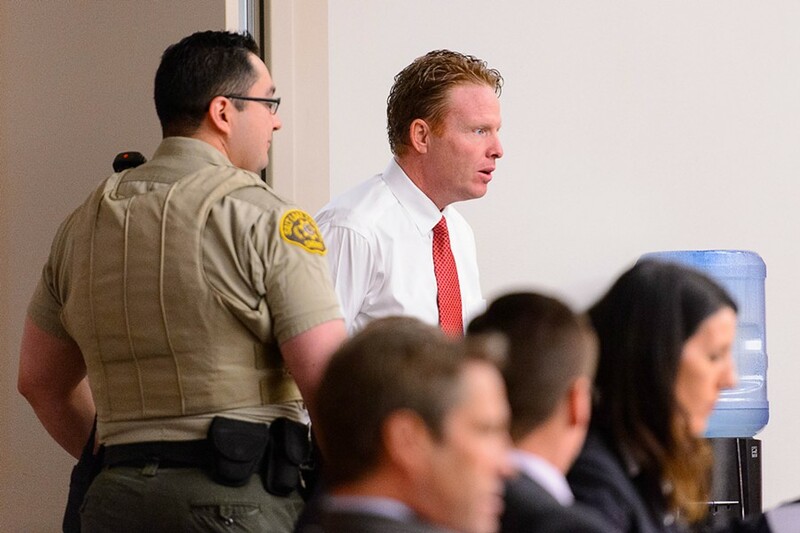 Disgraced internet entrepreneur Jeremy Johnson. 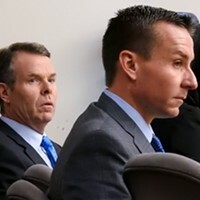 The third week of the John Swallow trial kicked off Tuesday morning in 3rd District Court with Jeremy Johnson once more declining to answer questions on the stand and Judge Elizabeth Hruby-Mills informing the former iWorks online businessman—and now federal prison inmate—that he didn't need to return to court unless he had changed his mind. Last week Hruby-Mills sentenced Johnson to 30 days in the Salt Lake County jail for contempt after he refused to testify. The prosecutors and Johnson's attorneys have been trying to reach an agreement as to an immunity deal that would allow Johnson to testify without fear of the feds coming after him, but Johnson's attorneys Mary Corporon and Karra Porter, remain unconvinced by what's on offer. At Tuesday's end, it emerged that the prosecutors had put in an order for Johnson to be transported Thursday—which seemed odd, given that they were looking at ending their case on Wednesday—and hope desperately it appears that his time in the county lock-up and whatever they can come up with in terms of an immunity agreement will convince him to talk on the stand on Wednesday. 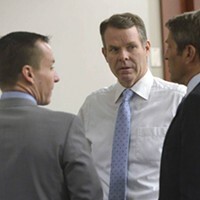 Tuesday's testimony shed light on both the personal relationship between Swallow and deceased pay lender top dog Richard Rawle and a controversial fundraiser for the former AG put on by a well-healed couple involved in a case that both Shurtleff and Swallow had oversight over. Former Check City employee Court Walker recalled how when business owner Richard Rawle was dying of cancer in late 2012, Swallow gave Walker a document detailing the history of their relationship he wanted Rawle to sign. The document wasn't entered into evidence, although why wasn't made clear. Walker's testimony also related to gold coins the generous Rawle would give to employees in the late 2000s, including Swallow who was his general counsel from 2004-2010. Each gold coin was worth between $1,200 and $1,700. Walker recalled seven to 10 occasions where, at Rawle's request, he'd loaded money onto pre-paid debit cards for Swallow as payment for the coins which he had asked to sell back, although he had not seen documentation relating to these sales. Walker also talked about the evolution of a lobbying group that the entrepreneurial-minded Rawle set up called RMR Consulting. One RMR client was Jeremy Johnson. Swallow was concerned that he was being paid out of monies that came from the lobbying contract and asked Rawle to pay him out of a different account. Swallow and Rawle were very close, Walker recalled. 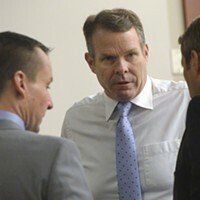 While the prosecution focused on an email titled "Invoice"—wherein Swallow put in writing a request for $15,000 for his legal services on a Nevada project involving a limestone quarry—Walker agreed with Swallow's defense attorney Scott Williams that the informal tone of the three-line invoice would have been consistent with Rawle's management style. By mid afternoon, Swallow's former campaign manager Jessica Fawson Rizzuto took the stand. She testified to Swallow's almost "hypochondriac" obsession with the "optics" of his campaign, meaning how his actions might be perceived by the public. 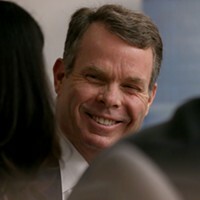 Fawson cited the example of a candidate wearing a BYU-emblazoned hat in Salt Lake City as the kind of thing Swallow was very concerned to avoid. She further described how Swallow had amended the in-kind contributions from a fundraiser at the house of Jennifer and Tim Bell to a lower amount than the originally documented $15,000 contribution relating to the cost of the event. Fawson said she was "shocked" by his action. While she then told the court that neither Shurtleff nor Swallow had ever done anything in their campaigns she viewed as illegal, when prosecutor Fred Burmeister asked if altering an in-kind contribution listed at $15,000 to $1,000 on campaign disclosure forms "would be illegal in your mind?" she answered yes. The Bells had sued Bank of America over the foreclosure of their home, challenging actions by their subsidiary Recon Trust. Tim Bell, who owns a medical device company called BellMed Resources, took the stand shortly after 4 p.m.
Much of Bell's testimony focused on the fundraiser held at his house. Back in 2012, he asked a childhood friend to handle the event, which was attended by 50 people or so. Bell's event-planner friend's experience was in wedding receptions and the event was far more ornate than Bell had expected, with a string quartet, food and libations. "It was unfortunate that no one was available to get married," Bell said dryly. "It was perfect for that." At the end of the event, Swallow learned that the Bells were the same Bells who were suing Bank of America, a lawsuit the Attorney General was also involved with. His demeanor was one of "surprise" said the understated Bell. HIs friend's catering bill came to $28,000 "and change," Bell said, leafing through the receipts on the stand, and he wrote off half as a business expense. Bell was asked by Swallow's campaign to revisit the amount he had listed on campaign forms online and change it to $1,000; he was later asked to change it back to the full amount. Bell talked, with some regret, about having also invested in state witness Marc Jenson's ill-fated central Utah development, the Mount Holly project, into which he had sunk almost $500,000. Jenson had been his Sunday school teacher in the LDS Church. "At that time I looked up to him," Bell recalled. He noted that his wife's testimony, expected the following day, would undoubtedly highlight "my pattern of foolishness."